Remember the "half chick" that was struggling to get out of his shell last Monday? Well he had a dickens of a time. He tried and tried, but couldn't make any progress. Gradually throughout the day we picked off pieces of the shell and tried to give him a helping hand. As the day went on and he made no additional progress, I finally eased the shell open and he came spilling out, exhausted. We let him dry off in the incubator, and then moved him into the brood box with the other chicks. He just didn't have the energy to stand, however, and his legs were swollen and misshapen. We fully expected him to die. But to our surprise, he survived! In fact, I can't even tell which chick was the late-comer at this point, meaning he's blending in just fine with the rest. We did lose another (darker) chick, but that's not unexpected. In all broods, it's not uncommon to lose about 10% of newborn chicks. Here's Major, investigating the peeping noise. ...and collected 32 eggs, much fresher than the last batch and hopefully more viable. Into the incubator they went. That was yesterday. Then this morning I added another four eggs, for a total of 36. We'll see what happens in three weeks! Meanwhile, this little guy was sleeping so soundly he looked dead (which, I assure you, he wasn't). How way-trey-totally cool is that?! I wanna do that. When do you move them outside? Isn't nature amazing? I love to see the struggle for life and then make it against all odds. That chick is a real champ. Say, that's a good name for him/her! Oops, forgot! If you are gonna eat 'em - you can't name 'em. Just added 'Lavern' & 'Shirley' to my coop. Should be getting eggs from them in another 8 weeks. Keep us posted with pics. Just love the little critters! 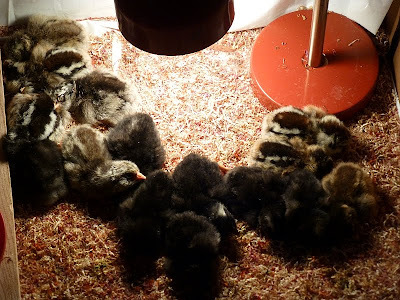 The first time we had baby chicks and saw them sleeping we thought they were dead. Very scary. Watching chicks hatch is so much fun and rewarding.